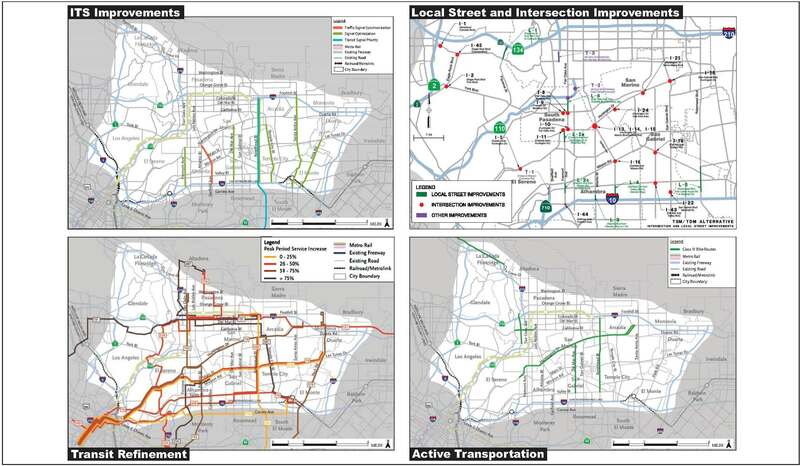 There are five alternatives under study (shown above): the legally-required no build option, a freeway tunnel, light rail transit between East Los Angeles and Pasadena, bus rapid transit between East Los Angeles and Pasadena and operational improvements to existing roads, intersections and traffic signals. 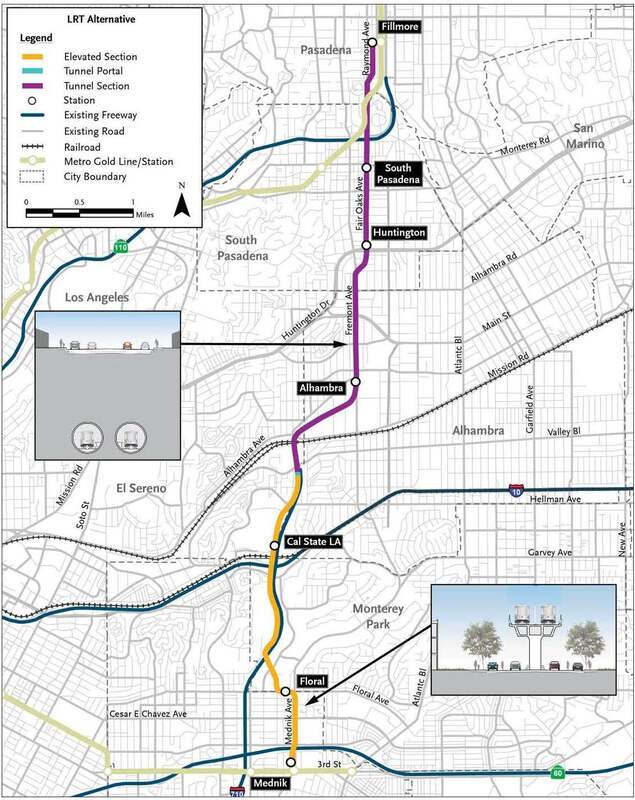 What is the estimated cost of the light rail transit between East Los Angeles and Pasadena? 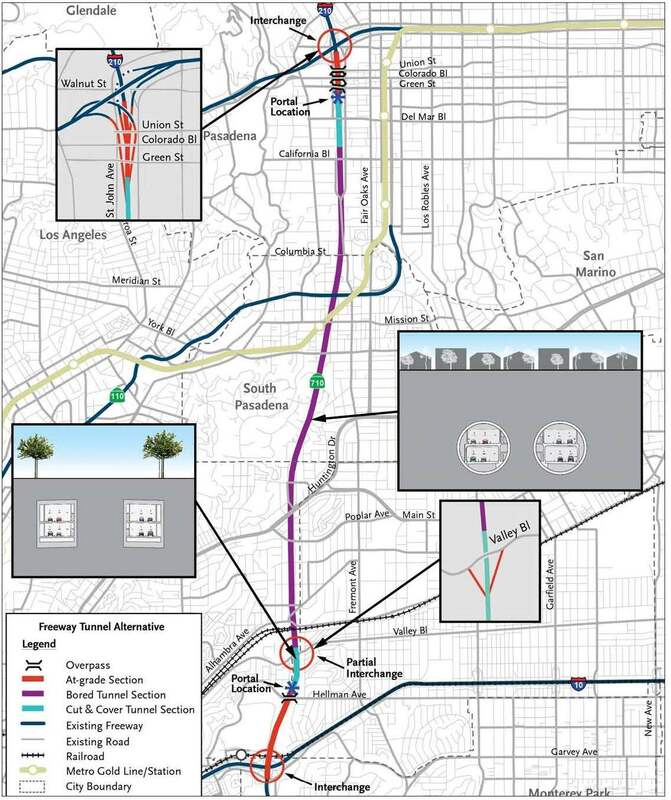 What is the cost to for this option– bus rapid transit between East Los Angeles and Pasadena and operational improvements to existing roads, intersections and traffic signals. Would the combined cost of these two projects be less than building the tunnel? The combo of these projects might ease the street traffic at a much lower cost then building the tunnel. The costs are listed with the alternatives in the Executive Summary of the study. The estimated cost of the BRT alternative is $241 million in 2014 dollars, the estimated cost of the LRT alternative is $2.42 billion in 2014 dollars and the estimated cost of the freeway tunnel alternative is $3.15 billion for a single-bore tunnel or $5.65 billion for the dual-bore tunnel variation (both in 2014 dollars). The Executive Summary provides a good overview of the study and different alternatives. Thanks for the response Steve.. I’m in favor of the light rail along with the improve bus service and and operational improvements to existing roads, intersections and traffic signals. Money and time is the bottom line for this project. This saves a lot and money plus it avoids the big dig and all the problems the problems that comes with building the tunnel. Some extraordinarily flawed analysis in that document. Perhaps the worst: if you read the air quality technical reports, it assumes that technology will make cars so clean that freeways are cleaner than rail by 2035. It talks about technology prompting 80% reductions in emissions of some pollutants. That’s beyond stupid, and it reads like a document struggling to justify a decision already reached rather than an honest analysis. Worse, it doesn’t make any corresponding assumptions about technical improvements that could affect other modes, like cleaner electricity powering light rail. If a project needs people to speculate about future technological improvements in order to make it pass the laugh test, then it’s a fraud on the voters who will be saddled with the bill–and the pollution, when these speculative improvements fail to materialize. This is a terrible project, and it needs to be abandoned now. 1,200+ pages and they don’t suggest a preferred alternative to move forward. Quite the hot potato. Let the fireworks show begin! This can massively improve traffic on the 405 and 5 if we can shunt all the truck traffic through the tunnels. Improve westside traffic by sending all those trucks straight north. Would also improve westside air quality, seems like a win win win everyway I look at it. Though I wish we could just bulldoze all those cal trans owned houses and build a proper above ground freeway. Way cheaper and more effective and gets all the traffic benefits of closing the gap. As I’m sure you know — and just to make it clear to anyone reading — a surface freeway is off the table and that alternative was not studied in this report. I continue to not understand why the light rail and BRT options are considered as alternatives to this freeway. Regardless of how I feel about transit (good) and driving (bad), no one is going to drive from Long Beach to Alhambra, park their car, and take the bus to Pasadena and back. This is doubly true for the cargo at the port! If these transit options are good, we should build them. If not, we should not. Either way, they are not actual alternatives for the freeway. Jason I agree there is little to no benefit to the light rail and BRT options. The destinations do not solve commuter issues. The tunnel is the boldest and best solution. It’s needs to be done eventually and all anyone is doing is denying the inevitable. Let’s get it done and move this forward. Jason, the Blue line will be traveling from Long Beach to Pasadena and beyond in 2019/2020. This is spot on. It’s for cargo trucks, not people. I love BRT, I think it’s the way of the future. But cargo from the port cannot ride BRT. The SR-710 Draft EIR/EIS has 26,625 pages. There is the Report (1,294 pages), the Appendices (966 pages) and the Technical Studies (24,365 pages), which are all part of the Draft EIR/EIS. When you add them all together the total is 26,625 pages! Perhaps that’s why the Caltrans site isn’t accepting comments until March 12, which — to me — seems like a curious decision since many of us have waited many, many months to express our thoughts on this project. Given the relatively small amount of dollars and the quick timeframe turnaround, the most sensible choice would seem to be to adopt the Traffic Systems Management changes. Even if any of the other options were adopted, they’ll take a very long time to implement (not to mention the dollars involved). In the meantime, implement and study the TSM changes, which will provide at least some help to Alhambra and other cities, and then use those results to determine if the options are worth spending the time and money. Given the cost of the other options, particularly the tunnel, $105 million for the TSM fixes is almost rounding error. Bob I agree it’s the short term solution but why. The tunnel won’t get built without private $$$. Which means a P3 option. California, and in particular Caltrans needs to stop being so closed minded and embrace alternative means of project delivery. No one in the private sector is stupid enough to drop billions into a freeway tunnel. The ROI on this project is laughable. Hopefully CalTrans sees the light, before they dig our state even deeper into the hole. LA needs another freeway like it needs a hole in the head. Agreed. TSM should be a recurring, ongoing project for all cities regardless of bigger scaled projects. The tunnel cost figures are completely baseless and Metro knows it. Even a novice engineer knows this tunnel is going to cost an absolute minimum of $10 billion, barring any unforseen incidents, like what happened in Seattle and Boston. Metro has always wanted the freeway tunnel and this report is clearly written to make that alternative seem beneficial to all and completely harmless environmentally. Make up your mind Metro! Do you want a future of more auto use, congestion and pollution or do you want the region to embrace alternatives, including transit?? Transit Rider, you are absolutely correct about Metro’s cost estimate for the twin toll tunnel option being way off. They have to cling to that $5.4 billion estimate, no matter how inaccurate it may be, because it’s been in the Long Range Plan for so long. SCAG’s estimate in 2007 of $11.8 Billion is more accurately the true cost. It’s time for Metro to fess up about the true costs of the toll tunnels if they expect the public to go along with another sales tax with Measure R2. Measure J lost by a fraction of a percent because of the inclusion of the SR 710 tunnels. Would the light rail option continue northeast past the Fillmore stop, along the existing gold line tracks? As described in the study’s Executive Summary, the light rail option’s northbound terminus would be in a tunnel under Raymond Avenue, which is adjacent to the Fillmore Station. That would allow passengers to transfer to NB/SB Gold Line trains. Any idea why they wouldn’t just combine the lines so riders can reach the actual destinations in Pasadena? Fillmore seems like a random stop to terminate… the cynical side of me thinks this light rail option is being designed as a low ridership/pointless route, so that the freeway tunnel wins out in the end. You are absolutely right and I can confirm this 100% from the inside- Metro and Caltrans have never taken the transit alternatives seriously. – and they never will. The top people running this study are born and bred highway engineers and highways are the only “alternative” they know. They have wanted to “finish” this highway for decades and they will try to convince you of its necessity through 25,000+ pages of technical jargon that make cars sound like they emit harmless air and giggles. 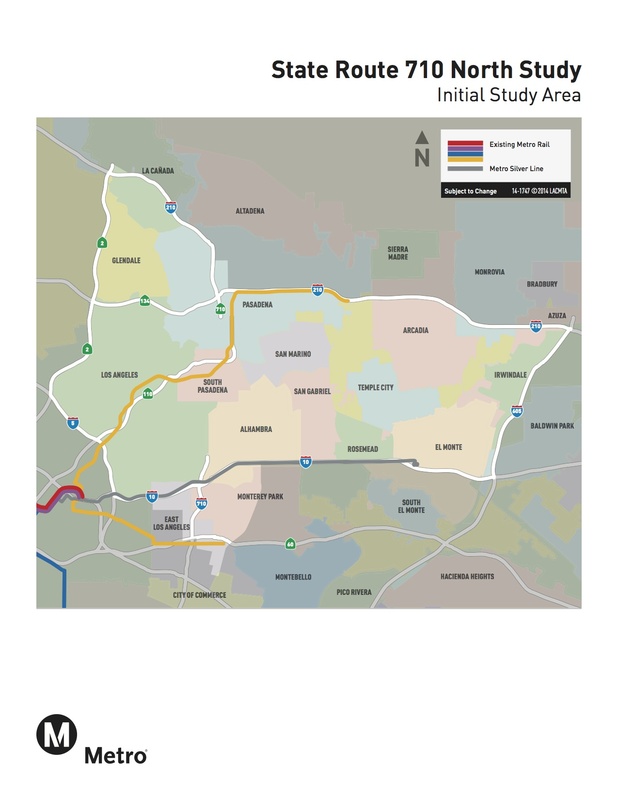 Read the report and see how terrible the Light Rail and brt alternatives were put together. They are simply afterthoughts that the community forced them to study. 10 billion is overstating it, we built the red line subway tunnel a similar distance, under worse terrain, and it was only a couple hundred million. If anything we should be wondering why metro has increased the costs of these tunnels or the 405 tunnels by one or two orders of magnitude compared to the red line tunnels. Probably just making themselves and their buddies rich skimming a couple billion rather than following a realistic budget like the red line to noho. Adam, there is a difference between a subway tunnel and the SR710 Tunnel. The diameter for a subway is about 20 feet, the SR710 tunnel is 60 feet…. There also has not been any proven success with a 60 foot diameter boring machine. Google “Seattle Tunnel” and learn. You cannot compare the cost nor schedule for building transit tunnels to tunnels like the ones proposed here. The proposed tunnels are 60 feet in diameter compared to something like 33 feet for a transit tunnel. The original cost for the Seattle tunnel of the same diameter, but only 1/5 the length, was just over $1 billion per bored mile. Metro claims to have based their estimate for the 710 tunnels on this number. However, if you extrapolate, 2 tunnels x 4.5 miles per tunnel = 9 miles x $1 billion/mile = $9 billion, not $5.4 billion. Of course, Washington State DOT and Seattle Tunnel Partners, the private firm building that tunnel, are already fighting over who is responsible for the over $200 million cost overruns they have already incurred. Who knows how much it will be by the time they finish — if they finish. The cost of tunnels isn’t the length but getting it started and then the geology. The ground here is far better than both boston and Seattle all low lying areas near the ocean. Yes it will cost a lot but the private sector is begging for projects to put their money into. The tunnels have been and will be the option. The funding, design, and construction must come from private and not caltrans. They can’t handle so etching this large similar to the bay bridge let the experts in the private sector find the innovation and efficiencies. Steve, you and everyone at Metro always refer to this project’s purpose as “addressing the gap in the 710 freeway”. Thanks for revealing Metro’s true and longstanding intention to ” solve” this “gap” with a freeway tunnel and nothing else. It’s completely clear this is how you and Metro management view this project – a freeway tunnel or nothing, based on how you frame the issue. There is NO gap! If this is a gap, then there are DOZENS of other freeway gaps in LA. And why do you never mention all the “gaps” in our rail system??? If the freeway tunnel is adopted as the “preferred alternative” (and who are we kidding, it will, despite what Steve Hymon claims) Metro can kiss any 2016 ballot measure goodbye. In case Metro management doesn’t get it by now (the newer employees tend to be more progressive), LA is no longer eager to keep building roadway infrastructure that only leads to more traffic and congestion. You would think SOMEONE at Metro is familiar with Induced and Latent Demand – simple transportation concepts that are ignored by management in their never ending quest to lay down more asphalt and get more cars on the roads, all so they can sit idle in congestion 8+ hours a day. Why does Metro insist on 1950s thinking when ALL the evidence shows that you cannot build your way out of congestion? You’re just repeating the same mistakes over and over, Metro,,and expecting a different, more favorable outcome!..isn’t that the very definition of insanity? Congestion is caused by congestion building alternative roots are part of progress to diversification of traffic flow. IF we build the tunnel option, it should be exclusively carpool/high tolls and a truck route to get most of the truck traffic off of the local roads. Those who want to go solo, in their cars, should be charged a minamum of $3.00 for every 1/4 mile of travel. By doing this, not only will people be enticed into carpooling, but when those people realize that they could have used transit at a much less cost they might start to use and, hopefully, enjoy it. I really don’t see that light rail, in this case, will improve the situation enough to make a difference. That is, unless that light rail goes all the way to Long Beach, Harbor City, Wilmington, and San Pedro. If it doesn’t, it’s totally useless. The surface street improvements do NOTHING to relive all the truck traffic from the surface streets! The freeway option doesn’t just encourage more of the same, it precludes every other outcome. Before the cost overruns reach into the billions, before the tunnel opens and increases the overall auto capacity of LA’s freeway system without reducing travel times, this thing should be killed in the crib. I agree with some of my fellow commentors. The figures in this seem to suggest a predisposition for the freeway alternative, and I’m only one person, but I would not vote for a measure “R2” that involved any money to construct this freeway, nor would I encourage anyone I know to do so. Agreed… Metro will lose my vote in 2016 as well, if they enable CalTrans to go through with this boondoggle. Well it really depends on what the problem it is that this project is supposed to solve. If it’s truck traffic, then it should probably be the freeway alternative (max 2 lanes on each side, including one truck lane on each side, and the other being a HOT 3+ lane). The project should be a public-private partnership with the tolls split between the highway operator and for transportation enhancements along the corridor, similar to the 10/110’s Silver Line service. “General purpose” lanes should NOT be included in this project. I remember Metro lines 260 and 762 used to be part of the 12 minute map, but now they’re running at 20-25 minute intervals. Maybe with tolls, some of the money can be used to bring back some lost bus service and to introduce new service, and when the ridership is up, then we should build one of those light rail lines being studied. I’m a transit enthusiast and user, but I don’t see how a light rail line would do much for alleviating congestion in the 710 corridor. 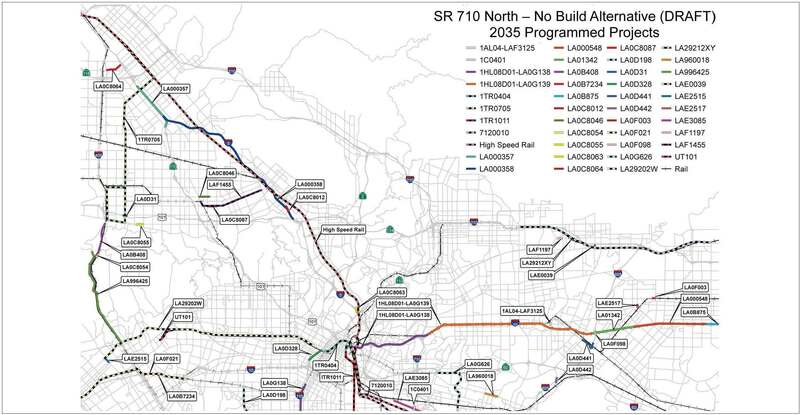 A major problem with a highway tunnel, however, is this: the proposed 710 northern terminus would be the I-210/SR134 interchange, which already operates at capacity during the every-lengthening rush hours. Inevitably, northbound traffic would back up into the tunnel, a not pleasant–even claustrophobic inducing–experience, not to mention the air quality problems. The billions that a tunnel would cost would be much better spent elsewhere in the transit system, e.g. grade separating many more intersections. I would recommend extending the 710 via surface to Mission, allowing a greater access to northbound streets that would help distribute traffic over a larger area. Their strategy of not building a freeway to avoid traffic has resulted in a 40-year traffic jam. It is immoral that, through their opposition, they seek to continue to avoid their share of the regional transportation burden by diverting traffic and pollution to predominantly poor and minority communities along the I-5 and Alhambra. If we adopted their stance that more freeways just bring more traffic, we can solve traffic problems overnight by ripping out all the freeways. Never mind that the proposed toll tunnels aren’t really like freeways we are used to; they are more like underground ExpressLanes. These demand-based, carpool-friendly “freeways” will be the most intelligent anyone has ever built in a generation. What’s immoral is spending $5-10 Billion (with a B!) on more auto capacity when we can’t even afford to maintain our existing streets and highways. This will lead to even greater longterm debt obligations, hindering economic prosperity across class lines for generations. A more cost effective solution would be to stripe some freight-only toll lanes on our existing highways, so big rigs can bypass regional traffic at rush hour. Done and done. Why is it that when people point out to the powers-that-be that their action or inaction will perpetuate race or class inequality, that’s automatically labeled as race-baiting? Your solution of freight lanes just brings more traffic into the existing corridors and worsens the inequality. Expanding those freeways would result in vastly more property condemnations – of poor and minority-owned properties – than building a tunnel. What is worse is this continued shouting-down of common-sense solutions. South Pas already won the freeway fight by forcing a costly underground corridor at everyone’s else’s expense. They’ve got the Gold Line that improves mobility in their City. It’s time to step aside and let the rest of us who also pay taxes improve our lot. You’re missing my point: why expand highways anywhere in LA? What sense does that make when the federal highway trust fund is teetering on bankruptcy, and we can’t even fill potholes, replace water mains or fix bridges in this country? What’s the point of throwing billions at projects that create very little economic growth? The longterm debt obligations from that line of thinking just leads to higher taxes and deeper service cuts, and for what – to shave a minute or two off crosstown commutes? wow, who are you to label anyone against a freeway tunnel a NIMBY?! Have you ever stopped to realize that the entire LA region is NOT supportive of spending $5-25 billion for a tunnel that will undoubtedly incur major cost overruns and extraordinary delays? Have you not heard of Boston’s Big Dig or the status of the Tunnel Boring Machine in Seattle, bleeding the city of millions each DAY it sits broken? And you think the tunnel is going to “solve” the “40 year traffic jam”??? You sure are banking a lot on a single transportation project..one that will only encourage MORE traffic, MORE auto/truck trips through the area, and attract MORE trips from other parts of the county that currently avoid the area? You want to put out a giant welcome mat to more traffic, which actually hurts LOW INCOME and MINORITY neighborhoods the most since they are often subjected to freeway-adjacent locations (your argument that more freeways somehow helps the most vulnerable in society is so baseless it doesn’t even deserve a response). News Flash: building more and more freeways does NOTHING to “solve” congestion – there is so much evidence of this, just simply google induced and latent demand, or look up traffic volumes before and after major freeway projects (including ones where freeways were REMOVED, like the Embarcadero in San Francisco). But you want to continue digging the hole, right? Let’s keep repeating past mistakes over and over, fooling ourselves that THIS freeway is going to be the one that FINALLY solves our traffic problems! Thankfully the majority of educated, progressive people in the county know that we cannot continue down this path. 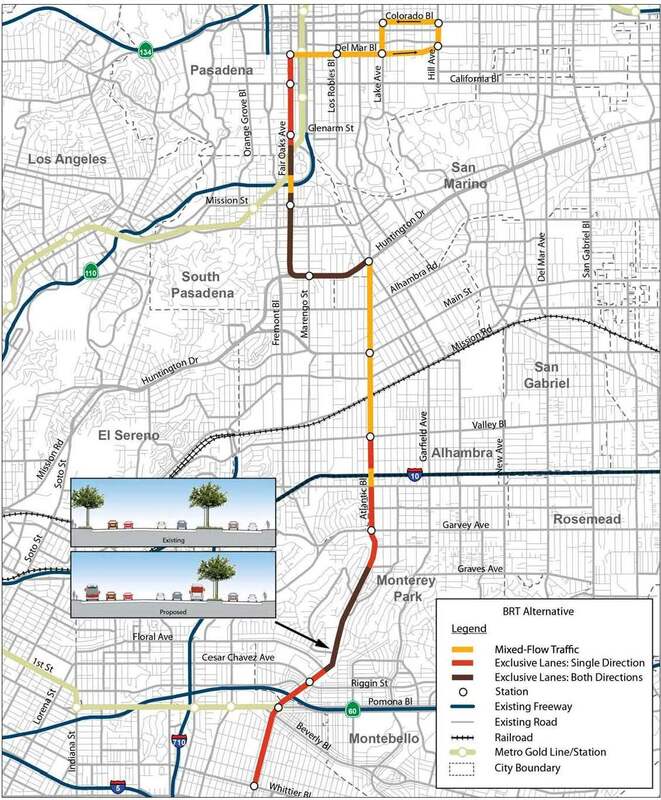 I will cry many tears of joy if we get light rail from Pasadena to East LA. I highly doubt it will happen, but what a miracle it would be. The future of LA can be so bright. Instead of taking at face value statements that “freeways just create more traffic,” let’s look at the EIR. The freeway alternative happens to be the one that improves mobility the most and relieves congestion the best, above and beyond every other alternative. People should be rightly skeptical of every other alternative simply because they just don’t solve any problems. Besides, has it occurred to you that the freeway alternative is the only one that actually makes money? Sure, it’s expensive. But it also does the most work, and toll collection means that it will eventually be paid off. The millions collected under the ExpressLanes project is already being funneled into corridor improvements. LRT, BRT, signal improvements, and road expansions all require subsidies and will cost money forever into the future. People who don’t like these facts have already jumped on Metro, accusing them of favoring the freeway. Well, let the facts be challenged through the courts just as opponents have for decades. Maybe the EIR was actually done right. It’s hard for me to believe you have read the Draft EIR. The section titled Transportation Technical Report, does not agree with your statement. In fact, if you read that section and look at the tables, you will find that freeway traffic does not get better, it shifts around. Traffic gets a lot worse on the 210, 710 and 5 freeways. Arterial traffic congestion actually gets worse too. Those are the Facts right from the EIR that you state was done right! I love riding me some Metro. I love riding transit and the idea to be green. But this should be built. Gas would be saved and a lot of time would be saved. It only benefits a small portion of the population not to build this. But will benefit everyone that travels though this area. Sorry to tell you Ray, but not many will benefit. According to the Draft EIR in the Transportation Technical Report (Table 4.9) reducing the cut through traffic through out the study area means 7-13% of all motorist using the tunnel will receive a travel savings not much more than 2.5 minutes. This also means that 87-95% of motorist will get no significant time savings, and most likely their travel time will be worse. A small reduction in time for a few at the cost of 5.6 Billion dollars (and I’m sure that amount is incorrect). Sounds like another 405 Freeway, Boston’s Big Dig, Seattle Tunnel “Fiasco” to me.